As Milwaukee’s Bublr bike-share system expands, how well will it work for lower-income residents? 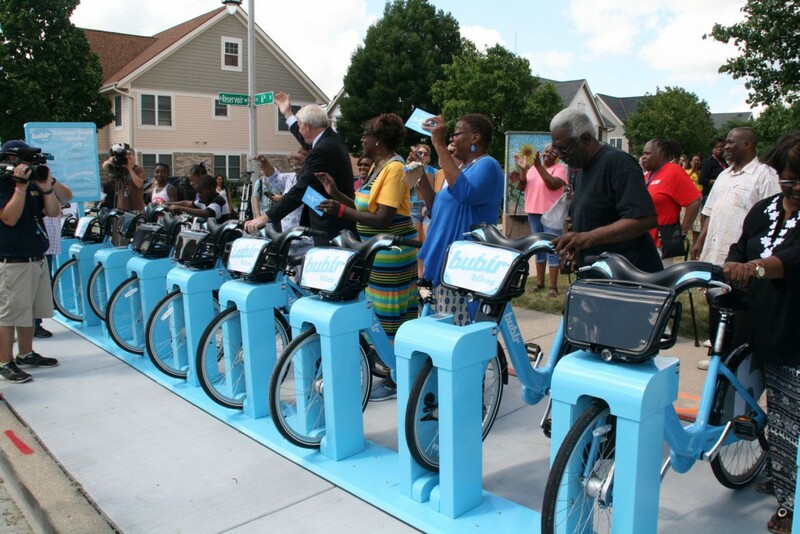 Bublr was awarded the grant in partnership with the Housing Authority of the City of Milwaukee (HACM) and DreamBikes. Besides simply installing stations outside public housing facilities, the organizations will provide assistance, encouragement and special events to promote the use of bike share as an efficient mobility option. Bublr announced the grant today at the ceremonial opening of a new station at N. 6th St. and W. Reservoir Ave. The station is located in front of HACM’s Lapham Park senior housing facility at 1901 N. 6th St. and just across the street from HACM’s Townhomes at Carver Park. As part of the program, Bublr will hire resident bike ambassadors to conduct neighborhood rides and demonstrate the system to fellow residents. Bublr will also promote using the system as part of one’s daily routine, as well as identifying and designing strategies to overcome barriers to use. The real coup for HACM residents is the 90 percent reduced annual pass, $8 for unlimited rides for the whole year. Bublr, which currently requires a credit card to use, has also created a cash-purchase option to make the system more accessible. According to Bublr president Kevin Hardman, Bublr will be “one of the first systems in the country that have this option,” and will work to make the cash option available to all riders. Elsewhere on the Network today: Greater Greater Washington reports that Virginia’s commuter rail agency may increase service frequency to operate more like urban rapid transit. Cycle Toronto supplies five reasons not to require bicycle licenses. And City Block argues that short transit station names are important to make systems comprehensible. Why Isn’t Bike-Share Reaching More Low-Income People?